A friend at work caught me by the drinking fountain a few days ago and mentioned something rather surprising: "I saw one of your paintings in a movie last night." Although I was sure he must be mistaken, my co-worker persisted and told me that it was a kind of "southwest looking landscape" and that my signature appeared clearly on the screen. Since I couldn't recall painting anything too "southwest" I assumed that a lucky Arizona painter named John Sneed must have had his work featured in a recent film. To satisfy my curiosity I went home and found the movie in question -- a 2011 independent thriller called "Leave" -- and watched it on Netflix. About three minutes into the film an old painting of mine that I hadn't seen or thought about in 30 years flashed onto the screen. 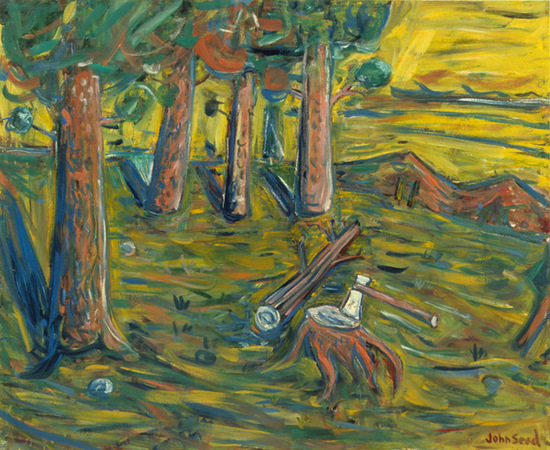 The painting, titled "The Woodcutter's Song," shows an axe wedged in the stump of pine tree at the edge of a brushy, expressionistic forest à la Edvard Munch. When I painted it my intention had been to make a zen painting inspired by a Japanese scroll painting of a monk who has a moment of realization when he hears the sound of his axe chopping down a tree. There was nothing "southwest" about it. Of course, people rarely get the same meaning out of works of art that the artist intends. I vividly remember being a fly on the wall in a Los Angeles gallery many years ago while a woman psychoanalyzed me vis-à-vis the painting: "It is a violent image that reeks of castration anxiety and murder," is roughly what I remember her saying. John Seed, "The Woodcutter's Song," 1983, oil on canvas, 66 x 54 inches After getting over the shock of recognition, I restarted the movie and watched it beginning to end. As it turns out, "Leave" is a very powerful film about a novelist who is haunted by a terrifying dream. My painting turns up in his therapist's office, lit by a lamp that seems perfectly positioned to highlight the embarrassingly large signature that I tended to use on my early paintings. I'm thinking that the movie's art director must have agreed with the woman who found the painting anxious because the scene it appears in is quite tense. So much for "zen." Above: scenes from the film "Leave," 2011, courtesy of Visualeyes Productions As I watched more of the film, I recognized that it had been shot in the swank loft of a downtown Los Angeles art collector who had purchased a number of my paintings in the mid-80s. I now understood how the painting had re-surfaced, but had to wonder: shouldn't I have been asked permission before the painting was used? I crowd-sourced the question to my Facebook friends, and they told me "yes." My wife also asked some online friends, and one of them sagely observed "There is a reason that paintings are blurred out in reality shows." I did a bit of research on the internet and confirmed that I owned the copyright to my painting: even when a work is sold, its creator retains the right of reproduction. A helpful webpage provided by photosecrets.com also confirmed that the display of my painting had been "substantial," meaning that it had been shown long enough and completely enough to justify a copyright claim. By the next morning my artist friends had left numerous anecdotes on my Facebook status, describing the screen appearances of their works of art. It was entertaining and informative to read what they had to say. "I had several paintings in a David Mamet film, 'Lipservice,' commented Maureen O'Connor, an artist based in Boston. "I was told my name would appear in the credits (no royalty). Needless to say, my name didn't appear. All I have is a copy, a friend made off HBO." Painter Kurt Moyer had better news. "John, I had a good experience a couple of years ago renting my work for a James L Brooks movie. They paid me a percentage of retail to rent the works." Kurt later told me that he had received a weekly rental fee -- 20% of each paintings retail value during the first week of the shoot and then 10% per week after that -- and that the production company ended up purchasing one of his paintings. Artist Mitchell Johnson told me that he has had good luck renting both paintings and reproductions of his paintings for use in TV and movies including "The Holiday" and "Crazy Stupid Love." If you happen to have seen Oprah Winfrey's recent interview of Facebook CEO Sheryl Sandberg you saw one of Mitchell's paintings in the background. Mitchell has earned royalties not only from the use of his original works, but also by licensing high quality digital reproductions. He often works with Jennifer Long at Film Art LA a firm that rents copyright cleared reproductions of works of art for use on sets. F. Scott Hess says he was paid well for the use -- and abuse -- of one of his works: "I had an 8 1/2 foot tall piece in Ridley Scott's 'Someone to Watch Over Me.' It was in a murder scene, filmed on the Queen Mary. And they poked a hole in it, so I got paid double to fix it." Jon Swihart -- a Santa Monica painter with superlative technical skills -- has often been asked to create original paintings for movies. For example, he painted a portrait of Tom Hollander, Captain Jack Sparrow's nemesis, for "Pirates of the Caribbean," and seven paintings for the slapstick comedy "Mousehunt." Jon says he has been very well paid for movie work: "Mousehunt" provided the down payment for his house. He told me on the phone that working on feature films can be intense and even terrifying, as there are deadlines to meet and big money being spent. Still, he relishes the work, and recently completed a portrait of Helena Bonham Carter -- as a ballerina -- for the soon to open film "The Lone Ranger." Buoyed by my friends, and feeling legally prepared after a quick email consultation with an intellectual property attorney, I telephoned Visualeyes Productions in Los Angeles. I got a quick response from Bettina Tendler O'Mara, the producer of "Leave" who couldn't have been more kind and professional. We spoke on the phone the next day, and after she consulted her notes and co-producers, she promptly paid an invoice for the use of my painting. 'Leave' is at first a haunting and fascinating puzzle of a story that grows into as touching and human a film as I've ever seen. Days later, the images and ideas of the movie hang in my head, a sure sign of a well crafted film. I'm pleased to have contributed to movie that Tom Hanks saw and admired. I'm also very proud of my painting, the accidental 30 year old movie star. "Fine Art in Film: Licensing and Fair Use Between Artists and Filmakers"